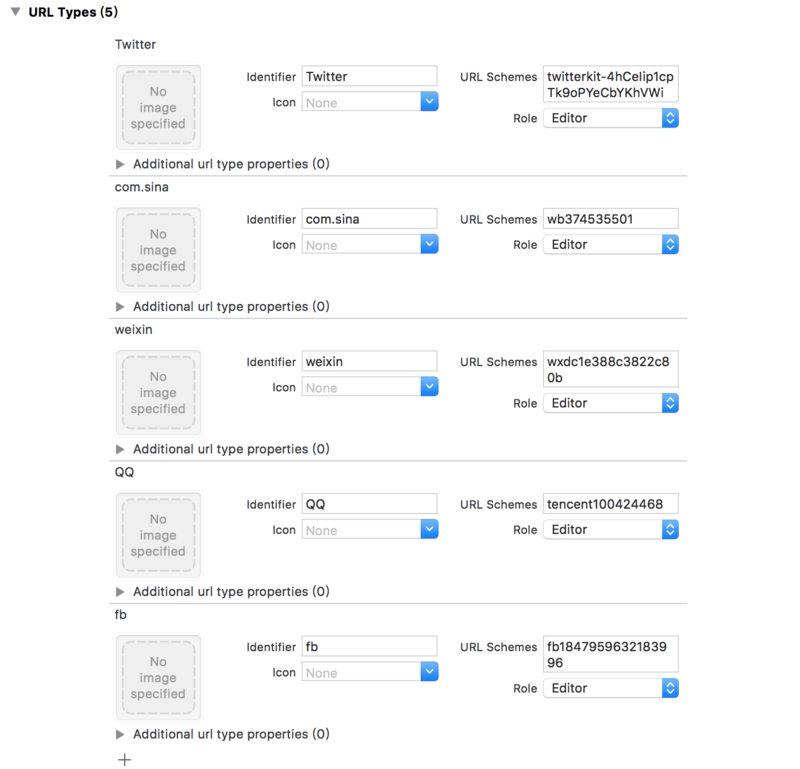 This article is a standard integration guide document for the JShare iOS SDK. The matching SDK version is V1.5.0 and later. Share content to three major social platforms including QQ, WeChat and Sina Weibo. Access to personal information on QQ, WeChat, Sina Weibo for third-party login. Share content to Facebook and Messenger, and access to personal information of Facebook users for third-party logins. Share content to twitter and get personal information of twitter users for third-party login. A complete iOS Demo project that demonstrates the basic usage of the JSHARE SDK. Refer to this Demo when configuring the SDK. Currently JSHARE only supports iOS 7 and above iOS versions. Run to Install Demo to Real Machine. Unzip the package and copy all the files under Lib into the project to start using the SDK. JSHARELaunchConfig class: The JSHARE SDK launches the configuration model. JSHAREService class contains all interfaces of share SDK. Initialize the interface. It is recommended to call in application:didFinishLaunchingWithOptions:. Callback interface of sharing, required! Below iOS 9, call application:handleOpenURL: of Appdelegate ; above iOS 9, call application of Appdelegate: openURL: options. For other interfaces, please see JSHAREService.h. Under iOS9/10, you need to add a whitelist for applications to jump to, that is, LSApplicationQueriesSchemes, otherwise you will return NO when the SDK determine whether to use canOpenURL to jump, and then only share/failed to share with webview. Apple will implement ATS (App Transport Security) starting from 2017. All network applications under review will support HTTPS. The following configurations will be invalidated. Please prepare in advance. At present, JShare supports webpage sharing in the absence of a Sina Weibo client. However, because Sina Weibo's api has not yet been optimized for https, it needs a corresponding https setting for Sina. In JShare, the webpage sharing of Sina Weibo is turned off by default. To use this function, you need to set the isSupportWebSina attribute to YES in the instance of the JSHARELaunchConfig class.